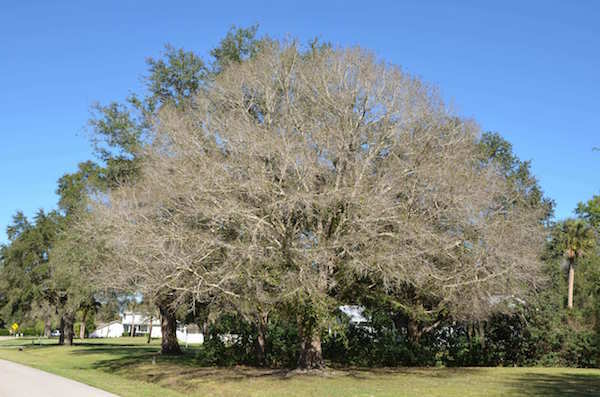 Answer: Your laurel oaks are probably from trees that were open-pollinated. Meaning genetic material were exchanged between parent trees having different genetic makeups. This difference included the time of seasonal leaf fall and the regrowth of new leaves. Some trees will drop their leaves before others of the same species.. The season for leaf fall extends over a couple of months mostly occurring during the winter. Thus, tree A will drop leaves at the start of winter, while tree B leaf fall occurs towards the end of winter. Chances are the order of leaf fall between tree A and B will repeat from one year to the next. Individual trees never become deciduous for too long since leaf regrowth happens as old leaves are falling. In addition, for many laurel oaks, leaf regrowth may not be uniform. Often the same tree may be in different stages of leaf renewal having both yellowish-green immature leaves and mature green leaves. Flowering and leaf regrowth of laurel oaks occurs simultaneously. In fall, acorns are also produced over an extended period. This natural variation of individual plant responding to their environment has led to the selection of early, late and extending fruiting varieties. Also, be sure that the trees you have are all laurel oaks. Laurel oaks are often confused for live oaks. The latter usually dropping their leaves after the former.